The Quadram Institute looks to support a culture of public engagement, reflecting the central importance of food and health to everyone’s life. Supported by the institute’s specialist engagement and communications team, scientists are encouraged and supported to engage with the public, schools, patient groups and primary, secondary and community care groups. The development of the new QI building will embed engagement with the public and patient groups within our working environment on a day-to-day basis, presenting us with exciting opportunities to listen to the needs, aspirations and concerns of the tens of thousands of visitors, patients and trial participants that will attend the Quadram Institute each year, and share our science. We want to create an environment for all of our visitors that triggers curiosity, inspires and educates. Within the QI building and grounds we are designing public spaces, including reception, café, atrium and garden, where stakeholder communities, researchers and clinicians can come together for two-way dialogue, creative engagement, art-meets-science collaborations and science communication. We are aiming to build upon these engagement opportunities to forge links with appropriate organisations to facilitate wider public dialogue at the national and international level. 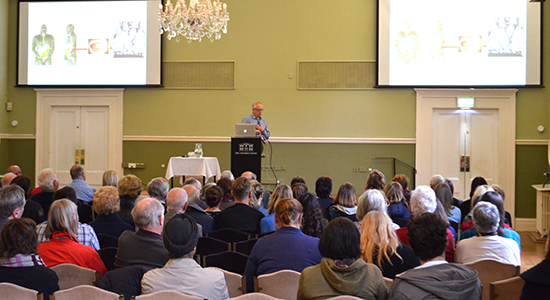 Our staff present talks to local and national community groups and associations on a range of food and health related topics relevant to our research programme. 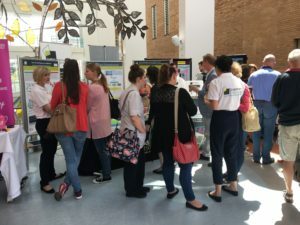 An event held in Norwich gave the public a chance to hear about some of the biomedical research being undertaken on the debilitating condition ME (Myalgic Encephalomyelitis). The event was jointed hosted by ourselves and Invest in ME Research, a charity promoting biomedical research and education into ME, which is aiming to establish a UK centre of excellence, to improve ME diagnosis and coordinate research into treatments and cures. Crowdfunding by Invest in ME and supporters has enabled PhD studentships hosted at QI and UEA, as well as sponsoring medical students to learn more about ME and promote future research. Since 2015, we have run a series of talks with the University of the Third Age, based around a general theme of “Healthy Ageing.” As well as helping this organisation achieve its objective of helping retired people with lifelong learning, some of the meeting were used to address particular questions posed by the scientists to this audience, aiming to gather their opinions relevant to future research directions. Our scientists regularly visit schools, following invitations, or through interactions with organisations such as the Teacher Scientist Network or STEMNET. Please email info@quadram.ac.uk if you are interested in arranging a visit to your school. We also participate in a number of other activities as part of our mission to inspire young scientists, such as the Year 10 Science Camp, and have collected a number of resources that we have used to engage schoolchildren and the public in issues surrounding food and health. We participate in science festivals, such as the Norwich Science Festival, as well as exhibitions, science cafes, talks and educational activities. The Quadram Institute encourages and supports its scientists to engage with print, broadcast, trade and online media, as a key way to communicate our science to the widest audience and to provide expert comment and context on issues relevant to our science. You can engage with us and our research on our social media channels, which are also a key way of keeping up to date on our news and activities.